A sample packet of Goodnight Darling's Deep Detox Bath Soak to destress from the holidays. A packet of The Sacred Well's Gratitude powder to be thankful for all you've done and the memories you've shared in 2017. Tarot of the New Vision by Pietro Alligo and Raul Cestaro (Illustrator) - a twist on the standard Rider-Waite-Smith deck to give you new clarity for 2018. A small bottle of peridot shards, a stone sacred to Egypt and well known for its protective, positive and healing influences. 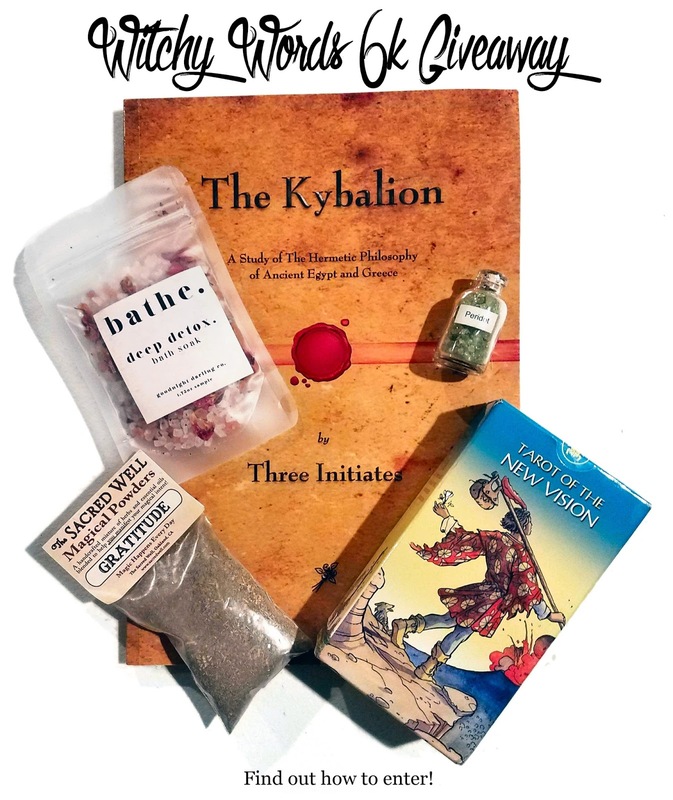 And, on the topic of Egypt, a copy of The Kybalion for your magical studies leading into 2018! Choose between my personal copy - highlighted with notes on my thoughts and interpretations - or a fresh, new copy of your own! One lucky winner will be selected at random on Thursday, December 21st! Congratulations to Tami Gregory of Lock Haven, PA! This promotion is in no way sponsored, endorsed or administered by, or associated with Facebook, Tumblr, Goodnight Darling, The Sacred Well or Lo Scarebo. In registering, you agree that you are providing your information to the owner of Witchy Words and not to Facebook or Tumblr itself. This information will only be used for this giveaway and deleted once the giveaway ends. You will not receive any mail or advertisements outside of this. Thank you! Thank you for the nice giveaway. Good luck to all entries! You're most welcome! Good luck to you, Kristina! Thank you! I received the gifts! I'm so psyched I won..again thank you! You are most welcome! I hope they're useful. Thank you for entering!